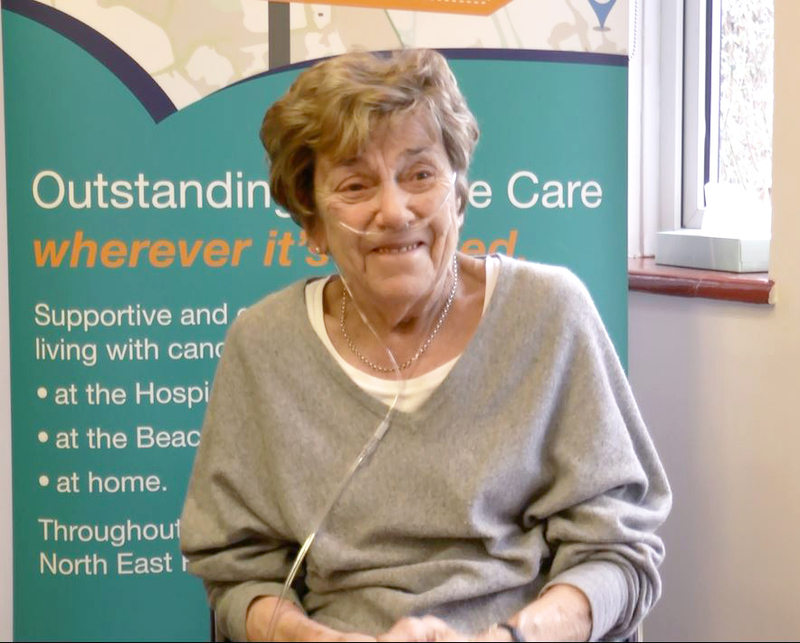 Annabelle has been a patient of the Royal Surrey County Hospital for over twenty years, and her condition, Chronic Obstructive Pulmonary Disorder (COPD), has worsened over that time. During a routine hospital visit, one of the nurses there suggested to Annabelle that she might benefit from the support which we offer at Phyllis Tuckwell, through our Living Well service. This service is designed to help patients and those closest to them manage the impact of their illness, cope with changes, improve their wellbeing and remain as independent as possible – so that they can get the most out of life. As well as medical and nursing care, it includes exercise classes, Social and Therapeutic Horticulture sessions, seated Tai Chi, cooking, meditative painting, art and creative writing groups, counselling, chaplaincy support, and sessions on topics such as how to cope with anxiety, manage stress and learn relaxation techniques. However, Annabelle was initially very apprehensive about going to a hospice when she wasn’t in her last days of life. Annabelle came to one of our Open House sessions which are held at the Hospice every Tuesday from 2pm to 4pm. “I came feeling that I was in totally the wrong place,” she says. “I didn’t need a hospice; I was going to be alright. Later, yes, I might need a hospice, but not now. My surprise was that I did need the Hospice.” At the Open House session, Annabelle met one of our nurses, Karen, who manages our Day Hospice sessions. These sessions run on Tuesdays, Wednesdays and Fridays, from 10am-4pm, and provide patients with access to all of our Living Well services. Annabelle was offered a set of twelve weekly Day Hospice sessions, and came along to her first one the following week. “The welcome when I arrived – well, I felt as if I’d been coming for years. Not only that, I had a wonderful cup of tea, and then someone came and said ‘would you like a massage?’, so I had a soothing back massage, which was wonderful. I often have back, shoulder and neck massages there now, and they really are lovely. Then lunch, well, the best omelettes in the business. Then relaxation classes. Well, that was the first Wednesday. The next Wednesday they said ‘we’re going to do gardening’ – I thought ‘gardening?!’. But yes! We met Lisi, one of the Occupational Therapists at Phyllis Tuckwell, and she talked to us about the restorative power of nature, and how gardening can reduce stress levels. The atmosphere and the joy of going to that class were incredible. You forget about yourself. As Annabelle lives in Guildford, staff at the Hospice told her about the services we offer at the Beacon Centre, which is close to her home. Friendship and support are one of the most important things that Annabelle has found at Phyllis Tuckwell. “The care, the love, the help, the understanding, have all been unimaginable,” she says. “It’s like a comfort blanket. Annabelle hasn’t always found it easy to be positive about her illness. “COPD is a very frustrating condition and I get very angry with it,” she says. “It stops me from doing things.” It isn’t only COPD which Annabelle has had to contend with. Some years ago she was diagnosed with breast cancer. Although she recovered, the cancer returned and she had to have surgery. “That, together with my COPD, made me quite an unhappy person and very much ‘why me?’,” she explains. After talking to Annabelle about how she was feeling, Karen suggested that she start seeing Sophie, one of Phyllis Tuckwell’s counsellors. “I was feeling very low,” says Annabelle. “I had very low self-esteem. You think ‘oh I can’t do that because of the oxygen; I can’t do that because I can’t breathe’. Through counselling I was taught to stop thinking like that. I can’t change my lung condition, but rather than let it run my life, I can run my own life, and not let my lungs govern me. We don’t think about our breathing normally, day-to-day, and that’s how I’m trying to be – although truly some days are more difficult than others. Through counselling and talking to people at Phyllis Tuckwell I’ve learnt to get my life back a little bit, and as the weeks have gone on that’s become greater. I’m more confident; I’m more positive. I don’t think ‘why me’ anymore. It was me; I can’t change that. The depression that can go with cancer and certainly with COPD as well is very, very frightening and you reach a low in your life when nothing, really nothing is worth it. Why bother? Why bother to put any make-up on? Why bother to do your hair? There’s no point. Who wants to go on anyway? And then you get to Phyllis Tuckwell, and you walk in the door thinking ‘what am I doing?’ Twelve weeks on I know exactly what I was doing. To help support more people like Annabelle please continue to play the Tuckwell Chase Lottery.